CiTV star Sam Homewood fronts latest THINK! 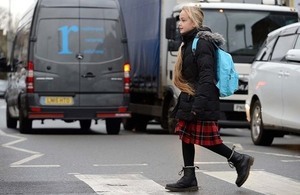 campaign to get children crossing the road safely – THINK! TV presenter launches a new ‘stop, look, listen, think’ road safety campaign to encourage children to think carefully about crossing roads. Children are being urged to ‘stop, look, listen, think’ in a new road safety campaign launched by children’s presenter Sam Homewood and THINK! today (16 May 2018). The CiTV star visited Holy Family school in Walthamstow to encourage children to think carefully about crossing roads as new materials for teachers, parents and road safety experts were released by THINK!. A new Safer Journeys Anthem, featuring the ‘stop, look, listen, think’ message, has also been launched, alongside other games, films and lesson plans, ahead of the half term and summer school holidays when children are likely to be spending more time outdoors. Britain has some of the safest roads in the world but we are always looking at new ways to make them safer. As more children take advantage of the better weather by walking to school or playing outside, it is important they know how to cross roads safely. THINK!’s new resources will make it fun and easier than ever for schools and parents to help children learn good habits that can last a lifetime. The government’s THINK! campaigns have helped reduce child road deaths by 90% since records began in 1979. However, 6 children die and 170 more are seriously injured every month on the UK’s roads. I’m delighted to be a part of this THINK! campaign to help spread the word about road safety among young people. Working with children every day, I see the huge impact that simple precautions can have on their lives. I hope this campaign will help keep children safe on our roads and encourage them to look out for each other. THINK! has been running campaigns for more than 50 years and has successfully challenged a number of behaviours and attitudes to improve road safety, including drink driving, drug driving and using handheld phones while driving. THINK! campaigns have helped reduce the number of deaths from 22 a day in 1960 to 5 a day in 2016. The new campaign follows a long and a proud tradition of hugely successful child road safety campaigns, spanning several generations and featuring much-loved icons such as the family of Hedgehogs, Kevin Keegan, James Earl Jones (the voice of Darth Vader) and David Prouse as the Green Cross Code Man. The campaign will feature across Facebook, Twitter and Pinterest.